Confused about something? Let's find an answer! We want to be clear and concise with all our information. 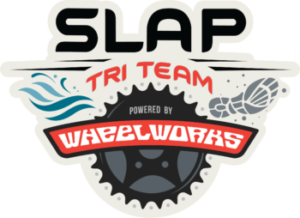 If you are having trouble understanding anything about the SLAP Tri Team - Powered by Wheel Works, please look here for some more details. And if you reach the bottom without finding an answer...please keep on scrolling to the "Contact Us" form at the bottom and send us a message! Why should I join the #SLAPPERS? We are a fun group of endurance-loving multi-sport athletes in Central Florida. The foundation of the team is having highly educated and experienced triathlon & swim coaches at all of the group training sessions. The #SLAPPERS support each other in training, racing, and in life! When does the SLAP Tri Team - Powered by Wheel Works start? All paying members of the 2018 SLAP Tri Team will remain on the team until the end of the year. All members of the 2018 WGWW Tri Team will remain at the free level. What if I'm already on a tri team? Not a problem! There are no limits to how many USA Triathlon clubs you are a member of. How do I join the SLAP Tri Team - Powered by Wheel Works? Check it out...we've made a comparison chart for you to see all the team options! Once you find the right level, just sign the waiver and sign up for monthly auto-billing. If you are looking for personal coaching, don't hesitate to contact us at SLAP for more details. Do I have to pay to be on the team? Nope! We've kept the FREE part of the #WGWWteam with free gear, "Sponsored-Athlete" store credit, the team environment at races, and monthly social events. Just sign the waiver and pick up your #SLAPPERS gear at Wheel Works. What happened to the #WGWWTeam? You are looking at it! We've merged the WGWW Team with the SLAP Tri Team to provide better coaching services, more training sessions, and quality equipment and team kits. What if I don't do triathlons? No worries! The #SLAPPERS are made up of all kids of endurance athletes...masters swimmers, duathletes, runners, swim/runners, adventure racers, aqua-bikers, etc. We provide experienced coaching for all! Do I have to be part of the team to participate in training sessions, camps, clinics, etc? Nope...but once you participate in one session with us, we consider you to be a part of the #SLAPPERS family. Technically, just sign the waiver and you are on the team! I haven't done a triathlon. Is this team for me? Absolutely! The #SLAPPERS are all levels of athletes. We even have a beginner triathlon program (SLAP Try A Tri) that will help you get through your first race in 8 weeks. I just want to learn how to swim. Can you help? Yes, check out the SLAP Adult-Learn-to-Swim page and contact us for more details about setting up your first lesson! I'm visiting. How do I participate for a short time? We have a $10 single-session drop-in fee for all coached training sessions. This includes the swim practices, run workouts, etc. **ALL WGWW shop rides remain free. Where can I get a bike and triathlon equipment? Head over to Winter Garden Wheel Works bike shop on Plant Street in Winter Garden and tell them that SLAP sent you! The guys and gals in the shop will make sure you get all the gear you need, and nothing you don't! What races are the #SLAPPERS going to in 2019? Here's a big list of popular local events that you will definitely find some other #SLAPPERS at. We will have the #WGWW tent, chairs, cooler and cheering squad at as many races as possible! We've got a team for them as well! Kids between the ages of 6-17 years old are invited to join the SLAP Youth & Junior Tri Team. We have coaches and training sessions across Central Florida.